Southern Russia is a region in Russia bordering the country's Central and Volga Regions to the north, Kazakhstan and the Caspian Sea to the east, Azerbaijan and Georgia to the south, the Black Sea and Ukraine to the west. Southern Russia boasts the nicest climate in the country, with warm Black Sea beach resorts, as well as Russia's most mountainous and exotic cultural destinations in the North Caucasus. Southern Russia's mountainous regions in the south are extraordinarily complex in terms of their various linguistic, political, and ethnic cultures, while the northern, plains areas of Southern Russia are more solidly Russian in character. Southern Russia is generally more humid and lush in the west, towards the Black Sea, and more dry and arid approaching the Caspian Sea in the east. 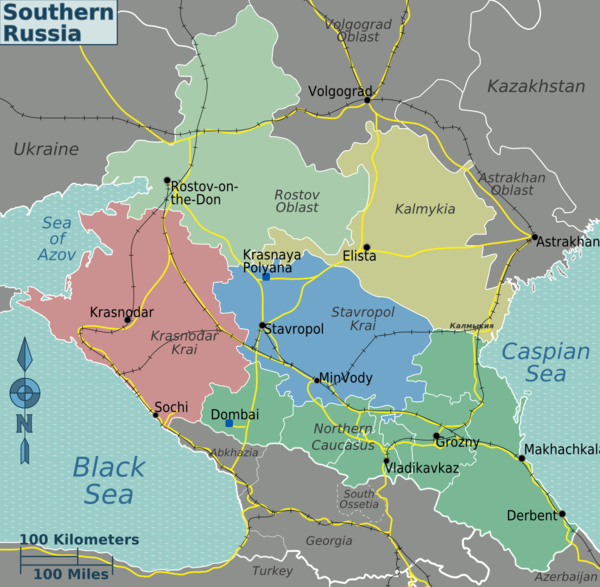 Long considered a Russian frontier akin to the "Wild West," Southern Russia has a fascinating history of Cossack and Russian expansion in the face of fierce resistance from Tatar and other Mountain peoples. This southern frontier plays a special romantic role in the Russian consciousness as the one part of Russia combining a decent climate, interesting topography, and endless opportunities for the adventurous. This romantic ideal is immortalized especially in Mikhail Lermontov's famous novella, "A Hero of Our Time," as well as in many of Pushkin's poems. Pushkin's most famous poem about the region, "Prisoner of the Caucasus" (Кавказский пленник), was rewritten as a short story by Tolstoy, and redone most recently in an excellent Russian movie that sets the same story in the modern day conflict (shot in Dagestan). The most unstable part of Russia Also has some of Russia's most beautiful scenery and is an important location due to oil and port's . Elista — one of Russia's most strange cities, home to several Buddhist monasteries and "Chess City"
Derbent — the oldest city in Russia, established 5500 years ago. Southern Russia is certainly the most complex linguistic region of the country, ranging from Mongolic Kalmyk, to Persian Ossetian, with dozens of languages wholly unrelated to any outside linguistic group. While this diversity makes the region an alluring destination to language nuts and ethnographers, the less linguistically inclined will find just about everyone speaks Russian. Southern Russia is serviced by rail primarily through Voronezh, from Moscow. Most such trains come through Rostov-on-Don and then on to Krasnodar or Stavropol. Rail service also exists from Kharkiv, Ukraine to Rostov-on-Don. There are daily domestic flights from Saint Petersburg and Moscow to the region's major cities, such as those listed above as well as the bizarre airport in Mineralnye Vody. In the regions with large non-ethnic-Russian populations, be sure to search out the many national cuisines of the region, many of them substantially different from Russian cuisine and frankly delicious. Travellers report substantially higher levels of corruption in Southern Russia than in the rest of European Russia. Corruption is mostly a problem during transportation due to the many road blocks ostensibly protecting Russians, but actually existing just to extort bribes. While corruption is a concern throughout the region, it is a severe danger in the unstable North Caucasus region. Throughout the North Caucasus intrepid visitors should be very cautious and aware of current developments in the region's sensitive political situation. There has been substantial violent crime and kidnapping against travellers at the hands of bandits, terrorists, and probably the authorities throughout the region. These dangers are especially severe in North Ossetia, Ingushetia, and Dagestan and Chechnya. The most common destination for travellers moving on from Southern Russia is Ukraine, in particular the Crimea, which most Russians would consider to be rightly a part of Russia, as it is populated by ethnic Russians. Recent years have made it easier for travellers to head south. The borders to both Georgia and Azerbaijan are now open. In the summer a ferry runs from Sochi to Trabzon on the northern Turkish coast. This page was last edited on 30 June 2018, at 17:37.